TAKING A STANCE A huge crowd of locals turned out in Knockmore last Friday night to voice their opposition to the closure of the local Post Office. KNOCKMORE has become the latest Mayo community to rally in their hundreds against impending cuts from Central Government after a huge crowd attended a public meeting in the local community hall last Friday to voice their disgust at plans to close the local Post Office. 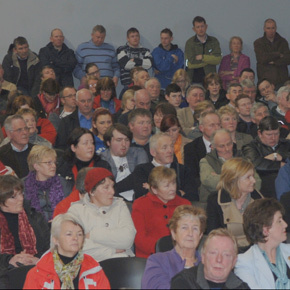 Over 500 people attended the public meeting according to Brendan Boland, PRO of the newly-formed Save Knockmore Post Office Action Committee (SKPOAC). Other speakers on the night included the Action Committee chairman Michael Rochford, Parish Priest Fr Michael Flynn, local councillor Seamus Weir, Deputy Michelle Mulhern, Deputy John O’Mahony and Deputy Dara Calleary. An Taoiseach Enda Kenny and Junior Minister Michael Ring had prior engagements. Mr Boland said Knockmore people in general were still in shock at the decision. Mr Boland went on to say that locals now had a very short window of time to make sure the decision is reversed by An Post as the deadline is April 30. Correspondence to the committee dated March 16, 2011 from An Post has stated that, in their assessment of the level of business at Knockmore, the availability and proximity of other offices in the area and their efforts to maintain a sustainable post office network nationally, it does not intend re-considering its decision to close our post office in Knockmore. The company has taken the view that there is no sound network or commercial justification for a post office in the village. Referring back to last Friday’s meeting, Mr Boland added that a large number of members in attendance expressed their concern on the closure, branding it ‘yet another attack on rural Ireland and local communities’. Glowing tributes were paid to the retiring postman Billy Rodgers and his wife Ann who have served the community extremely well for the past 36 years. “This campaign will continue through to the eleventh hour and beyond. We are calling on An Post to reverse their decision because we know that our post office is viable and sustainable into the future,” added Mr Boland. Meanwhile, Fine Gael TD for Mayo, Michelle Mulherin, voiced her objection to the proposed closure of Knockmore Post Office in the Dáil. Deputy Mulherin requested that the Minister for Communications, Pat Rabbitte TD, to do whatever is necessary to keep the post office that serves a thriving rural community open. However, Minister Rabbitte told Deputy Mulherin that it was an operational matter for An Post as a State company charged with running the postal service. Deputy Mulherin said this was not good enough and she would be working with local councillor Seamus Weir and the Knockmore community to have this decision reversed. “As far as I am concerned, An Post has acted like some ‘secret society’ and not acted in the interests of the community in Knockmore. It is the State company set up to provide a postal service throughout the country, including Knockmore. They have taken the approach from the start that the service was to be pulled from Knockmore. It was a foregone conclusion. Why have An Post refused to engage with them? If An Post had concerns or required changes to make the service viable all this could have been teased out. “I am glad to say however the Minister has given me a commitment that the mechanisms and reasons from the decision are laid bare so that this issue can be dealt with in an open and transparent way and we can know what the issues are which need to be overcome to retain the post office service in Knockmore and to be give the interested shopkeeper and the people of the community an opportunity to do so,” concluded Deputy Mulherin.